Before the purchase you need to know: This product for the installation of the picture, the actual delivery to save space is to take apart the packaging, so buyers need to have a hands-on installation capacity and spend about half an hour to install. if you mind, Pls do not order. Thank you for your understanding. ❤ Smart Storage ~ 9 Cube Storage offer you storage organizer, keeping a variety of items. 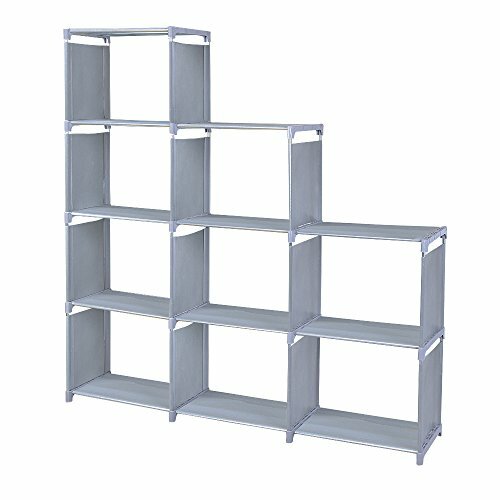 Storage Units can be used as a bookshelf, shoe rack, wardrobe, toy cabinet or display shelf. ❤ DIY for All Kinds of Room ~ Classic and functional design allows you DIY your organizer to match your room style perfectly. ❤ High Quality and Sturdy Construction ~ Cube Organizer constructed from 600D waterproof Non-Woven Fabric. Sturdy and durable to handle daily accessories. ❤ Easy to Install ~ All hardware includes 2 size tubes, 2 size connectors and 2 sizes fabric, Cube Storage Organizer can be assembled quickly with a wooden hammer. ❤ 12 Months Warranty ~ Storage Cubes constructed from connectors and panel with steel tubes, sturdy and functional, Storage Shelf organizer won't be out of shape after a long time service. Besides, BFSPORT comes with 12 months warranty. If you have any questions about this product by BFSPORT, contact us by completing and submitting the form below. If you are looking for a specif part number, please include it with your message.